The sun could not have picked a more perfect week to show it's face in Scotland. I am currently home on Easter break and everyday has pretty much been warm, sunny and downright beautiful. We've managed to have our lunch outside everyday and I'm trying to make the most of not having to wear a coat for once! 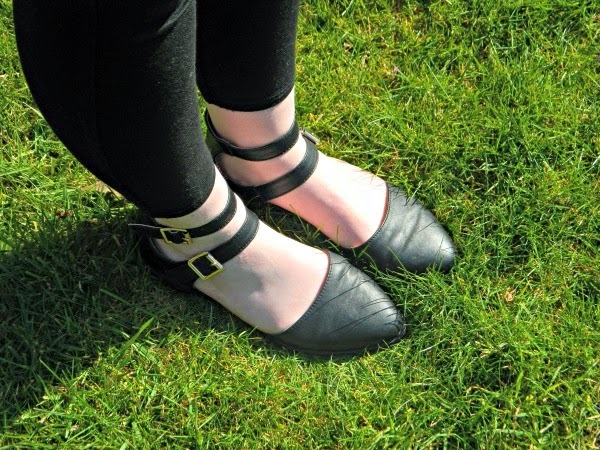 It's been pretty hard transitioning into Spring clothes as you never know in Scotland when the weather's going to turn on you and you'll be caught in a gale in nothing more than a dress and sandals! Today though I was just running errands and pottering about so I decided to brave a little transitional outfit. 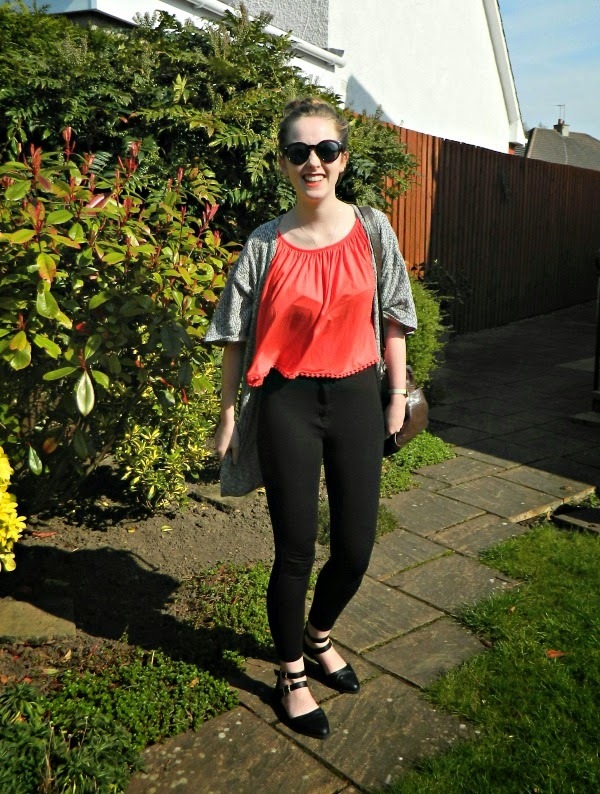 Now I'm usually a diehard monochrome lover and you will rarely find colour in my wardrobe but I was persuaded the other day by my Mum and sister to buy this little floaty coral top from Primark for £5 - bargain. It actually reminded me of one of those gypsy tops which were all the rage when I was younger haha. Before I found this I was pretty disappointed with the selection in Primark. I'd held off for ages going for a shop to save some money and was forever saying to myself, I'll come back with birthday money and have a splurge. But as is always the case when I came to wanting to spend money there was nothing I liked! I matched the coral top with my favourite matte balm by Revlon in 'Audacious'. It's a pretty brave colour but perfect for spring summer with minimal makeup and sunglasses as it adds that little something else to an outfit. I then (obviously) brought in some black and white pieces to balance out my splash of colour. These black high-waisted leggings/jeggings from Topshop are my absolute favourite and I actually even bought them for £10 second hand on Depop. Can't stay away from a bargain. My batwing cardigan is from H&M and goes with pretty much everything as you can dress it up or down. My shoes are also from Primark a few months ago, and I actually think they look far more expensive than they were at about £10! The double strap adds that little something that you don't always get with just regular pumps. Finally I accessorised with some cheap sunnies from H&M, my Olivia Burton watch which I got for my 21st and my beloved bashed faux leather Topshop bag which I also bought on Depop. I'm pretty damn proud of my second hand buys and plan on scouring the charity shops soon so that I can give my pennies to a more worthy cause. It's honestly so lovely to take a week off in the sun after such a hectic few months 10-8pm in the library. Definitely need some me time before I go head first into exam revision!